An unlikely group of freedom fighters team up to steal the Death Star schematics. An interesting mix of exciting heroic and tragic characters. 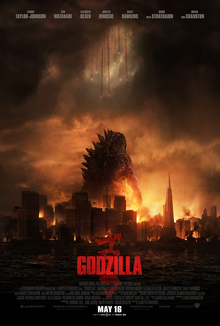 Director Gareth Edwards Monsters, Godzilla) and team are careful not to take anything away from the iconic 1977 classic Star Wars and successfully add to it, i.e the Death Star here doesn’t blow up planets in this instalment not to take any impact away from its destructive powers in A New Hope. 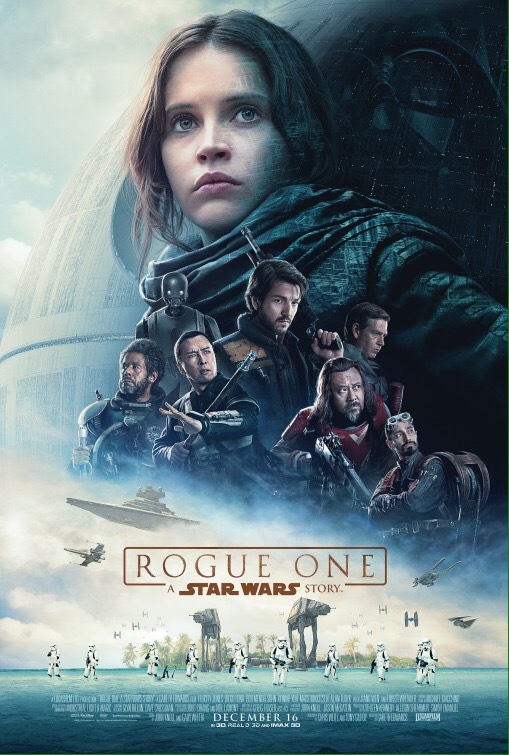 Still it shows it’s immense firepower as Felicity Jones as Jyn Erso goes about finding her father in a sea of defectors, rebels and insurgents including Saw Gerrera (Forest Whitaker). With great Star Wars action setups and battle scenes, that one could only have dreamed of recreating with toys as child this Star Wars story has plenty of thrills. Loaded with nods to the series and standing on its on two feet. The costumes effects and sets are fantastic and it captures the feel of the originals and bridges the prequels, Bail Organa (Jimmy Smits) adds to this. Michael Giacchino’s music complements John Williams’ previous scores. Edwards creates a sense of urgency here which helps reinforce Episode IV stakes including the famous first ’77 on screen appearance of Darth Vader. It’s also co-written by John Knoll, who joined Lucas Industrial Light & Magic 30 years ago and worked on Willow (1988). J.J. Abrams’ The Force Awakens captured the original trilogy’s spirit holistically, but Edwards manages to conjurer up the feel of the 1977 Star Wars Magic. The CGI characters of dead and favourites while not technically perfect are executed well enough too excite fans, namely the appearance of Tarkin (a resurrection of the great Peter Cushing’s character) and a pivotal female favourite who appears in the closing. Some X- Wing pilots, Red and Gold Leader have clever cameos. As well as an array of droids, littered throughout are the likes of the Cantina’s Ponda Babba and Dr. Evazan, R2D2 and C3PO. Extended purposeful meatier character appearances included General Dodonna, Mon Mothma, Vader himself (in three important scenes) who does not disappoint. Director Edwards doesn’t get hung up on on these cameos of sorts and keeps his eye on creating a wonderfully crafted grittier Star Wars film. The acting arguably surpasses its predecessors with too many actors to mention. Hardened rebel Andor played by Diego Luna cements a place in Star Wars history but Donnie Yen’s Chirrut Îmwe steals scenes as a blind warrior. There’s plenty of heart courteous of Mads Mikkelsen and lead Jones’ Erso. Notable is Alan Tudyk’s K-2SO who provides some great one liners as well as a memorable emotional moment. The star though is debatably Ben Mendelsohn as villain Orson Krennic, with the bureaucratic gravitas and emotional depth to leave a lasting impression. What it comes down to is that Edwards like Lucas manages to put on screen a Shakespeare-like tragedy mixed with Flash Gordon wonder that has all the familiar simple themes which makes stories great. Solid Star Wars entertainment all the way.